Among the new avenues that the students are exploring, is the fashion industry that has gained much popularity amongst the city's young, creative and talented individuals who are taking it up in hordes. Zenab Khan, an INIFD student, said, "The fashion world is all about creativity and it is something that I have always wanted to do. The wonderful opportunity of participating in a prestigious fashion week held in Mumbai is something that I can never forget. As I am from Bhopal and wanted to represent Madhya Pradesh through my designs, I picked up heritage as my theme and mainly highlighted Khajuraho. I consider reaching this level as a huge achievement. My ultimate dream is to soon launch my own fashion brand." Speaking on similar lines, Srishti Jaiswal, an ex-IIFT student, said, "I wanted to build my career in this field as it always fascinated me. Having got an opportunity to participate in a Mumbai based prestigious fashion show and showcase my designs before famous designers and receive a good response was something very special to me. Currently I have two websites and am planning to open a designer studio in Mumbai." Quite a few city fashion designing students have also landed plum positions with reputed fashion brands. Shreyansh Pradhan, from National Institute of Fashion Technology (NIFT), said, "It is like a dream come true to be working with Sabyasachi. It was not easy to make it to the brand but I worked hard on my designs and made the best out of things." Similarly, Rupal Sharnagat, from IIFT said, "Other than having my own collection line I am also associated with exporters from Jaipur. After participating in a Delhi based fashion wedding show my confidence level increased. I met Manish Malhotra and it was like dream come true. I always wanted to be in the fashion industry and now I want to see myself established in this field." 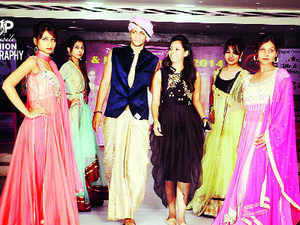 Commenting on the success stories of the fashion designing students, Pramod Lokhande, director, INIFD, said, "In the last two years many youngsters have shown an interest in this field. Earlier there were hardly any students opting for a study of fashion trends etc, but with changing times I have seen interest developing amongst youngsters. Many creative students have received opportunities to showcase their talent on big platforms and it is great seeing Bhopal youngsters coming out with flying colours."